When I first saw this game, I didn't think it would be very entertaining. The graphics are very simple, and I just wasn't expecting a lot from it. However, once I started playing, I was hooked! 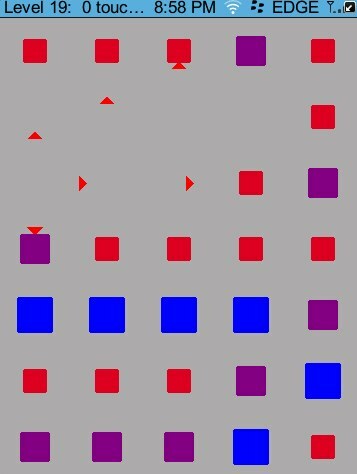 Xploding Boxes by Ebscer is a strategy game. The goal is to start a chain reaction that will explode all of the boxes on the screen. Each level gives you a different number of clicks, and requires a different strategy to solve. The first 25 levels are free, while the rest of the levels can be accessed by making an in-application payment of $2.99. Xploding Boxes starts with five levels unlocked, and every time you beat a level, an additional level is unlocked. The end result of this is that if you ever get stuck, you can usually just skip ahead to the next level, because there are always a few that are unlocked. Ebscer's plan is to continue to release additional content and levels for this game. Version 1.1 of Xploding Boxes will add levels 101-120 and will be released by the end of February.